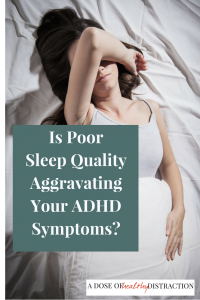 Is Poor Sleep Quality Aggravating Your ADHD Symptoms? Or is ADHD creating the poor-quality sleep? It’s one of those chicken and egg kind of questions. There have been some articles published discussing the role of sleep in ADHD symptoms. So naturally, I had to look into this. Many of my private clients have issues with ADHD and sleep. Sometimes they cannot fall asleep. Sometimes they cannot stay asleep. Others report they cannot force themselves to go to sleep when they are hyperfocused on something else. Lack of sleep makes everything worse, including ADHD. Both RLS and SDB require fairly extensive testing to confirm. This usually involves an overnight stay for a sleep study. For the purposes of this article I am going to talk about circadian rhythm disturbances, because it aligns more with the stories I hear from clients. Most of our Circadian Rhythms are regulated by exposure to light and darkness. Which is why some people suffer with seasonal depression and sleep issues. There has been some research into whether ADHDers might** have a delayed REM sleep state, but it is very difficult to interpret. The end result is that poor sleep exacerbates our existing Executive Function issues. As I discussed in this article, most stimulant medications increase the amount of circulating dopamine on our brain. The research on dopamine itself, and dopamine receptor activity in people that are sleep deprived is mixed. Some ADHD specialists actually have patients take their medications late in the day, because it balances out the neurochemistry, allowing them to sleep better. Personally, I have no problem sleeping and I take an extended release stimulant every day. With this in mind I reached out to Shire Pharmaceuticals. No, I am not being paid to say that. The reason I go to Shire with my questions is because they actually answer them. In fact, they allowed me to speak with Dr. Manisha Madhoo, their VP of Global Medical Affairs. Dr. Madhoo graciously explained to a clueless yours truly, that Shire recently presented a study at the American Psychiatric Association conference in New York City on some pretty interesting findings. When they trialed these patients on Mydayis, an extended-release FDA approved treatment option for those with ADHD ages 13 and older, they showed improvements in ADHD symptoms AND executive function regardless of their sleep quality. Improvement was seen in the following areas: number of days affected by poor sleep, sleep duration, sleep disturbance, delayed sleep cycle, and sleep efficiency. In this case, medication did not have a negative impact on sleep quality. If you have ever lain in bed at night staring at the clock, worrying about the next day, this is a huge deal. This study was small, so more research needs to be done. But sleep should be addressed in adults with ADHD. Bottom line: lack of sleep makes everything worse, including ADHD. Executive function and self-regulation will always be an issue. Sleep is another part of the puzzle. Learn the basics of ADHD so that you can make educated decisions about your own treatment. Stay tuned, Jennie Friedman and I are going to have a whole podcast about this subject! Want to know who else I go to for quality info on ADHD? Download my list of ADHD Experts! Who is Liz Cyber Stalking for Info?